This could be the story of any detail in Walt Disney World, but it happens to belong to The Many Adventures of Winnie the Pooh. Okay, that’s enough of my Sebastian Cabot impersonation. As guests make their way through the queue for The Many Adventures of Winnie the Pooh they are quite literally entering into the storybooks of Winnie the Pooh. 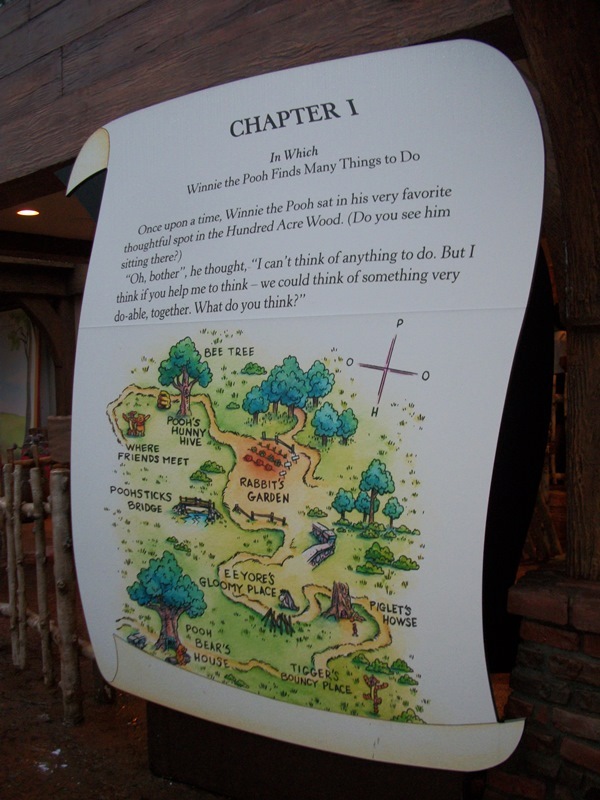 Guests obviously start at the beginning, in Chapter 1, with a map to help everyone to become acquainted with the Hundred Acre Wood. While most of the places found on this map, such as the Bee Tree, Rabbit’s Garden, and Eeyore’s Gloomy Place, are common, one spot may stick out as unfamiliar to friends of Winnie the Pooh. Poohsticks Bridge has a long history and is worth taking note of. Poohsticks is a game that dates back to The House at Pooh Corner. In Chapter 6 of the text we find Pooh holding a fir cone and trying to make up a song about it. Unfortunately, or fortunately depending on how you look at it, Pooh trips and falls, his fir cone slips from his grasp and takes a tumble off of the bridge and into the river. Bothered, Pooh sits down to watch the river, but notices his fir cone, which he had dropped on the other side, has come floating out the side he is sitting on. He repeats the process and eventually adds a second cone to see which one comes out first and if he can guess correctly. When he invites others to play, it is decided to use sticks instead of fir cones as they are easier to mark for each individual. And thus Poohsticks were born! This scene is recreated almost identically to the recollection in the book for the opening scene of Winnie the Pooh and a Day for Eeyore. The 25 minute feature debuted as an attachment to the theatrical re-release of The Sword in the Stone in March of 1983. It is worth noting that this feature was produced outside of Disney’s animation studio by Rick Reinert Productions, a first for Disney since the 1938 Silly Symphony, Merbabies. The game became a regular pastime for Pooh, Piglet, Eeyore, Rabbit, and the rest of the Hundred Acre Wood’s citizens. Its popularity didn’t stop on the page or screen however! Since 1984 annual individual and team World Poohsticks Championships have been held at Day’s Lock on the River Thames. Although the time of year, specific location, and host of the event has changed over the years, the concept remains the same, have the first stick to pass under the bridge and you win. It may seem like a silly game and an odd notion to include it in a map of the Hundred Acre Wood where guests are preparing to visit The Many Adventures of Winnie the Pooh, but isn’t that what Pooh is all about? Taking the time to stop and notice the world around you with those you care about most? I don’t know about you, but I think I need to head outside for a long overdue game of Poohsticks! Annnnd I read that in Sebastian Cabot's voice. It's the narrator! I hope on my next visit to WDW in Dec that I am able to slow down and absorb more of this type of detail and wonder that Disney is all about.